Last Friday, the 13th (oooOOooooh), I sampled the tapas at Boqueria with some friends. Tapas always bring back memories of my backpacking trip through Europe four years ago, where we had copious amounts of tapas, pork products and manchego cheese as we traipsed our way through Spain. Would Boqueria live up to those high standards? 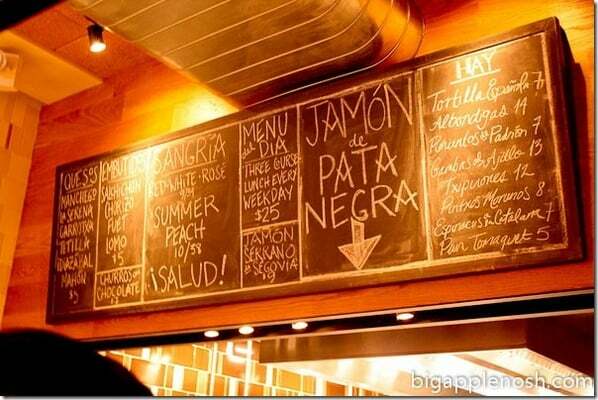 We were greeted by a large board featuring the specials of the day – special cheese, sangria, typical dishes such as tortilla Espanola, and….dum dum DUM!…in giant block letters – Jamon de Pata Negra! We also ordered my second favorite tapas dish (my absolute favorite is coming up later) – Bunuelos de Bacalao, or cod fritters! The citrus alioli was superb. The jury is out on this one – I wasn’t too crazy about these Patatas Bravas (crispy potatoes), but eating buddy really liked them. 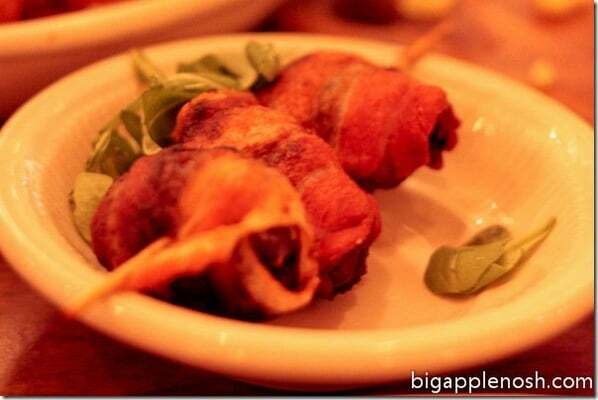 And finally, my go-to favorite tapas dish: dates stuffed with bacon and Valdeon, wrapped in bacon. LOVE this – sweet, creamy, crispy and porky all in one. Unfortunately, it was gone too quickly. Into my belly, that is. There was one mushroom that tasted sour, which although not unpleasant, was unexpected. However, the cheese was an excellent addition – the manchego did not melt completely and provided a chewy, slightly curd-y touch. 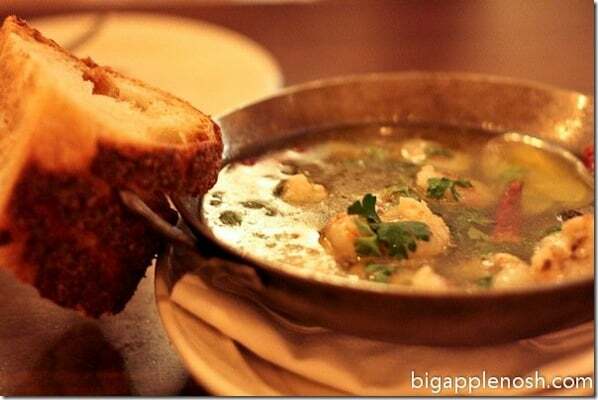 We also ordered the the shrimp with garlic and pepper in olive oil – the large chunk of bread that accompanied the dish was perfect for soaking up the garlicky goodness. Our final dish was the creamy croquette dish – three were mushroom croquettes and the other three were chard. 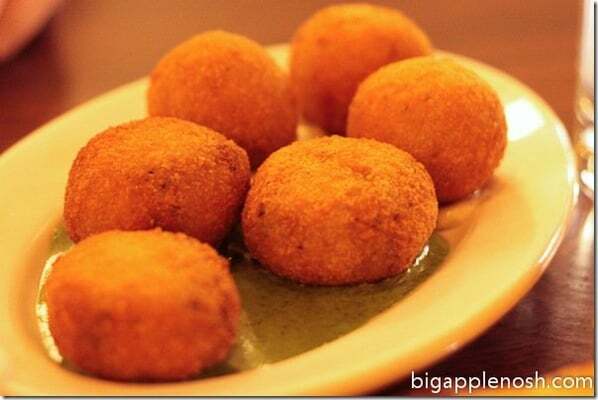 While croquettes are common in Spanish tapas cuisine, these varieties were not. The mushroom croquettes were especially delicious. Boqueria can’t compare to the tapas I had years ago in Madrid and Barcelona, but I challenge you to find a place in NYC that does (no really, find one and let me know!). That being said, the restaurant is perfectly suitable for primarily traditional tapas dishes, and the ambience is perfect for a Friday night out. The dishes are a little pricey, but if you split among friends or find a dining coupon, it’s not exceedingly tough on the wallet. 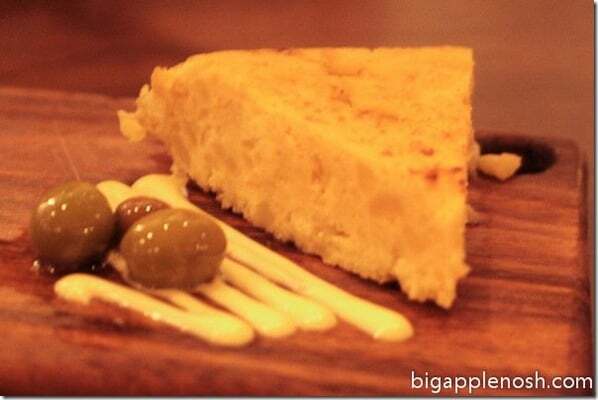 Dependable location for mostly traditional Tapas. There is also a Flatiron location, which I have not tried. Do you like tapas? 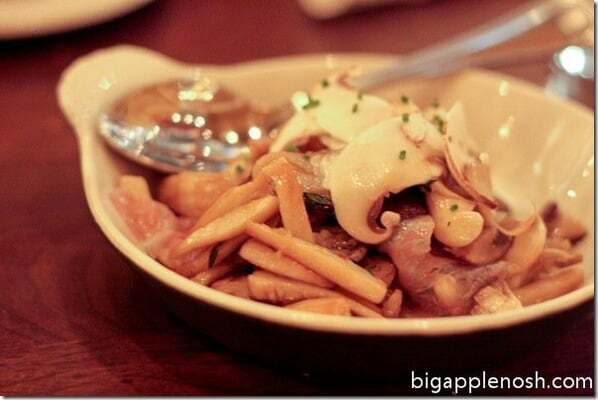 What’s your favorite tapas dish? Tapas are my favorite to share with friends. They are perfect bite-sized meals so you get to enjoy so many different varities of food. 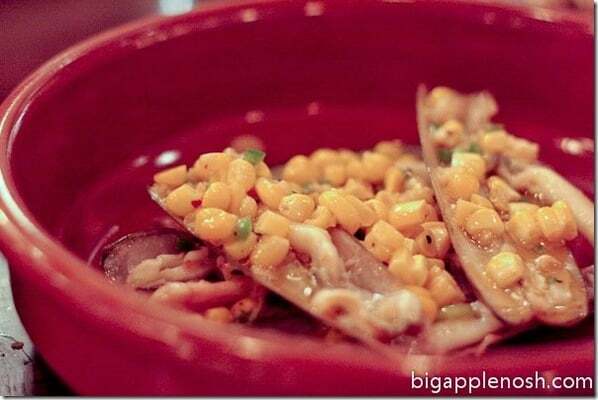 That razor clam dish looks like its right up my ally. I haven't had great tapas over here on the west coast but I'm still looking. oh i love croquettes. love 'em. 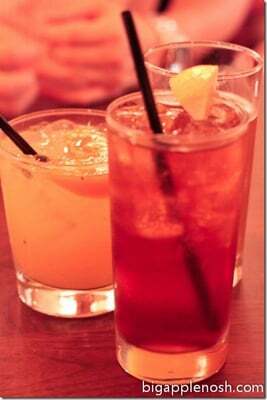 have you tried http://www.txikitonyc.com/ in chelsea? i went there once and it was pretty good! p.s. i love all your pictures of the food–amazing! I studied abroad in Spain for 9 months and I love tapas! Seems like a decent place to check out. 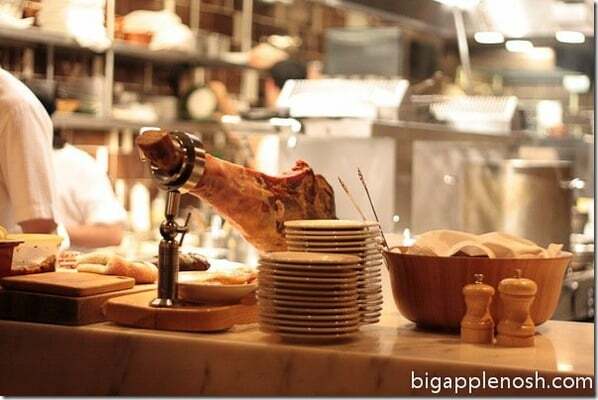 I agree–I have yet to find a tapas place in NYC that compares to Madrid or Barcelona itself! The food looks amazing. It's 10am here- can I go to lunch now? oh, i didn't realize they opened this location. if you want to try a really exciting place, take a trip out to newark, nj to Mompou. the prices are reasonable too, so i usually leave totally stuffed. Love tapas. 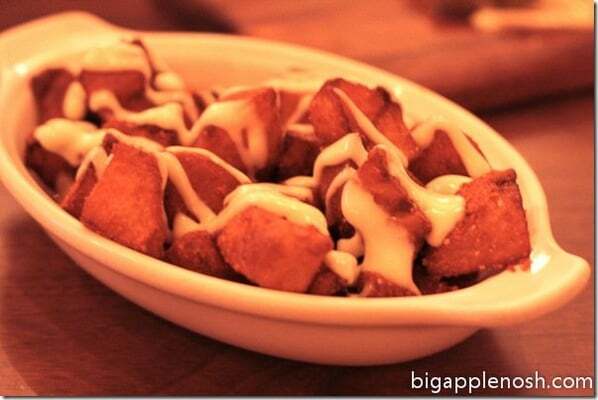 Patatas bravas are my favorite dish . . . every time my husband and I get to go to Jaleo in DC we get two orders of them and squabble over who gets to lick the dish. Yum!! 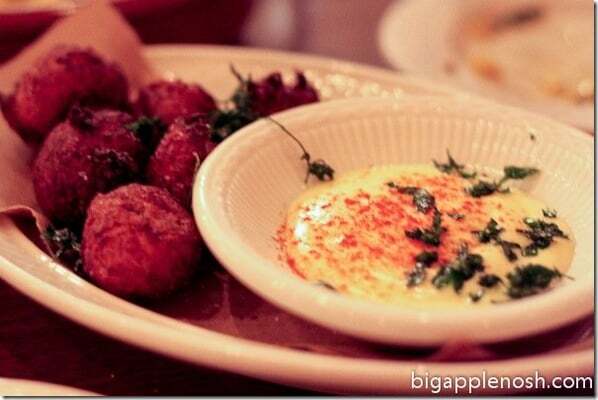 Tapas are delish and those pictures are making my tummy growl! I LOVE tapas except when it comes out in odd numbers! Who gets the last piece? Everything looks so good! I need to stop reading this blog before lunch time. I am so incredibly hungry right now and your post just made me even hungrier! Such interesting food choices. Would love to try someday <3. Oh and what a great sign to put outside a restuarant :)! This makes me hungry for home! I'll be in nyc for a couple of days next week before flying back to Spain so maybe I'll try this place. Great post and thanks!